My question then is: How come that he can give Php300, 000 pesos plus a Honda CR-V and yet he cannot even call me and instead requested me to call him for inquiries? And BTW, I can’t remember any raffle draw I joined in the past 12 months. This is just one typical example that spreads through mobile text messages. Most people though are aware of these scams and quickly reject it. But there are still people who are victimized by these obvious traps. Some even give money to retrieve the promised prizes. Be careful, when it is too good to be true, it’s probably not true. 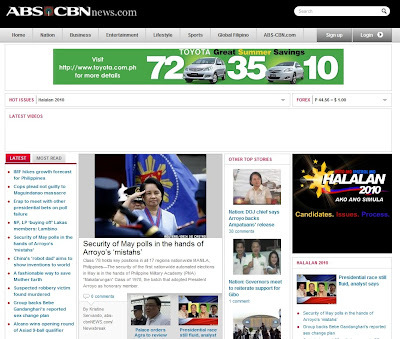 ABS-CBN News and Current Affairs website is undergoing a major redesign. The preview of the new look is available for viewing at www.abs-cbnnews.com/home. The new homepage slightly wider compared to the previous version. Also, the font color and sizes of the titles are more clearly contrasted against the background. Overall, the new layout looks neater than the previous version. The layout and positioning of major sections are also modified. For example, the Latest/Most Read section was formerly at the lower portion of the webpage. Now, it was located at the leftmost potion and contains more headlines. Other space consuming sections are now better located on the new homepage. The redesign is still on-going so we can expect more changes in the coming days. Last year, its rival site GMAnews.tv also revamped its website. With the fast development of information technology, news and other forms media are rapidly moving towards the internet. Image via Wikipedia You are surfing the web with your Firefox browser when suddenly, the website you entered causes your Shockwave Flash plug-in to hang or worse crashes the entire browser program. Some blame flash’s developer Adobe for this bug while others blame Firefox. While Flash has been a ubiquitous web plug-in for some years now, it continues to be the leading source of bugs that crashes all types of browser, not only Firefox. Regarding issue, Mozilla Foundation, the developer of the open source browser Firefox, recently released the beta version of Firefox 3.6.4. This latest version does not fix the bug but improves user experience when that bug occurs. Before, when Flash plug-in hangs, the entire browser crashes including all the opened tabs. NOW, with Firefox 3.5.4, only the affected tab will be allowed to shut down, leaving the rest of the unaffected tab open. Wanna have a sizzling summer experience? Wanna relax and chill under the shade of the palm tree? Wanna have solitude away from the noisy and crowded city? I have a suggestion. 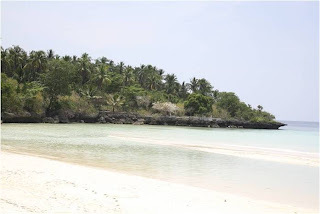 Why not visit Camotes beaches? Boracay has been the most popular tourist destination in the country, and for a very obvious reason: its beaches were above ordinary, crystal clear waters plus white sands on a very long and wide shore line. And when the evening comes life becomes more exciting as there’s party all around. But if you’re the type of person who seeks distance from the crowded and noisy city, but at the same time don’t want to have a boring night, well I would dearly recommend a Camotes Island escapade. It has the striking balance between boring place and crowded beaches. Yes, you heard it right! The much anticipated Initial Public Offering (IPO) of Gokongwei-owned low cost airline company is currently postponed pending results of the May 2010 election. Cebu Pacific listing to the PSE bourse was originally scheduled May 3.It is offering as much as 25.7 Billion worth of shares at a maximum price of 95 pesos. Many stock traders might’ve been disappointed with this latest news but Cebu Pacific is making a conservative move due to the volatility of the market after election. Anyway, if the election turns out to be peaceful, Cebu Pacific will soon schedule a new IPO date.